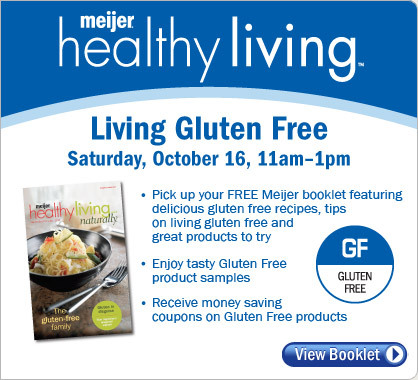 You’re invited to attend Living Gluten Free, Saturday, October 16, 2010 from 11am to 1pm at your nearby Meijer Store. While your there pick up a FREE copy of Meijer Healthy Living Naturally, The Gluten Free Family, enjoy tasty Gluten Free product samples, and receive money saving coupons on Gluten Free products. Get a sneak peak at the booklet.